The largest and loudest cannon, 25 inches long, 5 1/2 pounds. Features automatic charger mechanism for rapid multiple firing and automatic ignitor. 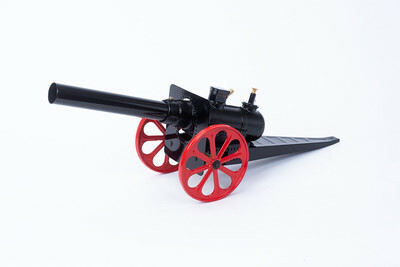 Shipping Fee:This cannon is not eligible for shipping discounts or free shipping promotions. Each cannon is shipped in its own box and is subject one S&H fee and may require an additional $5 to $8 for oversize fees to your address. Now Only $179.99... we ship quickly!